Bite into one of these truffles and what a surprise – a caramelised hazelnut in the centre! Preparation: 20 min. Cooking: 5 min. Chilling: 30 min. 1. In a saucepan, dissolve the caster/superfine sugar with 2 tbsp water to make a caramel. When it is ready, add the hazelnuts and mix thoroughly. When the hazelnuts are well coated with caramel, place them on a sheet of baking parchment and leave to dry. 2. In a saucepan, melt the plain chocolate cut into pieces with the cream and Nutella. Mix thoroughly until well combined, then remove from the heat and leave to cool. 3. Use a teaspoon to scoop up a nut-sized piece of the chocolate mixture. 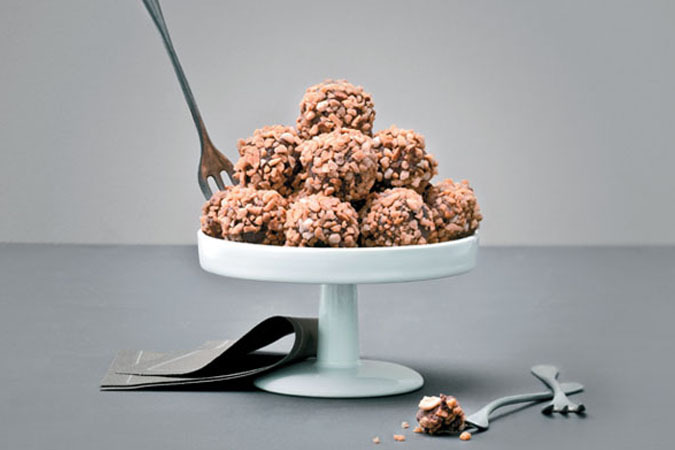 Add a caramel-coated hazelnut and roll in the palm of your hand to form a small ball. Repeat until all the mixture has been used, then roll the balls in the toasted, chopped hazelnuts. Refrigerate for 30 minutes before serving. Nutella: The 30 Best Recipes, by Ferraro U.S.A. Also available as an ebook.